The dsp.RLSFilter System object™ filters each channel of the input using RLS filter implementations. Create the dsp.RLSFilter object and set its properties. rlsFilt = dsp.RLSFilter returns an adaptive RLS filter System object, rlsFilt. 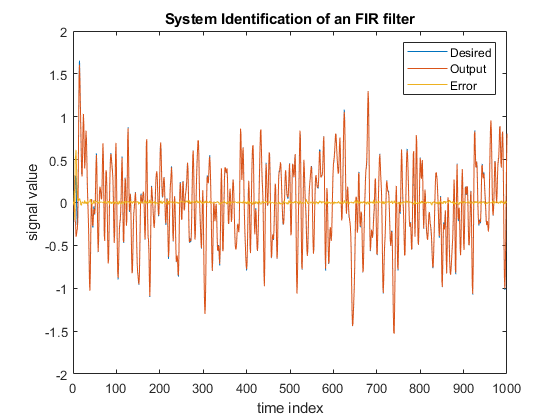 This System object computes the filtered output, filter error, and the filter weights for a given input and desired signal using the RLS algorithm. rlsFilt = dsp.RLSFilter(len) returns an RLS filter System object, rlsFilt. This System object has the Length property set to len. rlsFilt = dsp.RLSFilter(Name,Value) returns an RLS filter System object with each specified property set to the specified value. Enclose each property name in single quotes. Unspecified properties have default values. You can specify the method used to calculate filter coefficients as Conventional RLS  , Householder RLS  , Sliding-window RLS , Householder sliding-window RLS , or QR decomposition  . This property is nontunable. Specify the length of the RLS filter coefficients vector as a scalar positive integer value. This property is nontunable. Specify the width of the sliding window as a scalar positive integer value greater than or equal to the Length property value. This property is nontunable. This property applies only when the Method property is set to Sliding-window RLS or Householder sliding-window RLS. Specify the RLS forgetting factor as a scalar positive numeric value less than or equal to 1. Setting this property value to 1 denotes infinite memory, while adapting to find the new filter. Specify the initial values of the FIR adaptive filter coefficients as a scalar or a vector of length equal to the Length property value. Specify the initial values of the inverse covariance matrix of the input signal. This property must be either a scalar or a square matrix, with each dimension equal to the Length property value. If you set a scalar value, the InverseCovariance property is initialized to a diagonal matrix with diagonal elements equal to that scalar value. This property applies only when the Method property is set to Conventional RLS or Sliding-window RLS. Specify the initial values of the square root inverse covariance matrix of the input signal. This property must be either a scalar or a square matrix with each dimension equal to the Length property value. If you set a scalar value, the SquareRootInverseCovariance property is initialized to a diagonal matrix with diagonal elements equal to that scalar value. This property applies only when the Method property is set to Householder RLS or Householder sliding-window RLS. Specify the initial values of the square root covariance matrix of the input signal. This property must be either a scalar or a square matrix with each dimension equal to the Length property value. If you set a scalar value, the SquareRootCovariance property is initialized to a diagonal matrix with diagonal elements equal to the scalar value. This property applies only when the Method property is set to QR-decomposition RLS. Specify whether the filter coefficient values should be locked. When you set this property to true, the filter coefficients are not updated and their values remain the same. The default value is false (filter coefficients continuously updated). y = rlsFilt(x,d) recursively adapts the reference input, x, to match the desired signal, d, using the System object, rlsFilt. The desired signal, d, is the signal desired plus some undesired noise. [y,e] = rlsFilt(x,d) shows the output of the RLS filter along with the error, e, between the reference input and the desired signal. 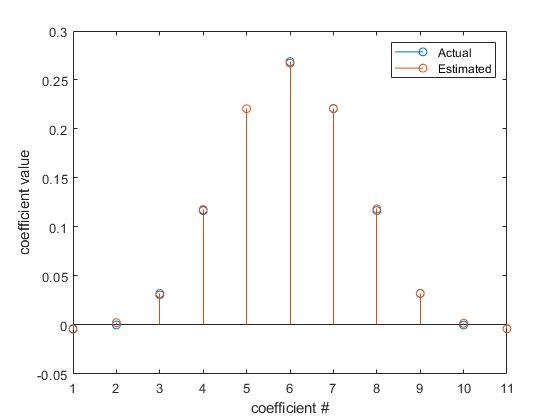 The filters adapts its coefficients until the error e is minimized. You can access these coefficients by accessing the Coefficients property of the object. This can be done only after calling the object. For example, to access the optimized coefficients of the rlsFilt filter, call rlsFilt.Coefficients after you pass the input and desired signal to the object. The signal to be filtered by the RLS filter. The input, x, and the desired signal, d, must have the same size and data type. The input can be a variable-size signal. You can change the number of elements in the column vector even when the object is locked. The System object locks when you call the object to run its algorithm. The RLS filter adapts its coefficients to minimize the error, e, and converge the input signal x to the desired signal d as closely as possible. Difference between the output signal y and the desired signal d, returned as a scalar or a column vector. The objective of the RLS filter is to minimize this error. The object adapts its coefficients to converge toward optimal filter coefficients that produce an output signal that matches closely with the desired signal. For more details on how e is computed, see Algorithms. To access the RLS filter coefficients, call rlsFilt.Coefficients after you pass the input and desired signal to the object. Use the RLS filter System object™ to determine the signal value. M Hayes, Statistical Digital Signal Processing and Modeling, New York: Wiley, 1996. S. Haykin, Adaptive Filter Theory, 4th Edition, Upper Saddle River, NJ: Prentice Hall, 2002 . A.A. Rontogiannis and S. Theodoridis, "Inverse factorization adaptive least-squares algorithms," Signal Processing, vol. 52, no. 1, pp. 35-47, July 1996. S.C. Douglas, "Numerically-robust O(N2) RLS algorithms using least-squares prewhitening," Proc. IEEE Int. Conf. on Acoustics, Speech, and Signal Processing, Istanbul, Turkey, vol. I, pp. 412-415, June 2000. A. H. Sayed, Fundamentals of Adaptive Filtering, Hoboken, NJ: John Wiley & Sons, 2003.